Can the average New Englander find produce grown in New England at an average New England supermarket on an average winter day? I went to my neighborhood Shaw’s to find out. If you want to eat local, should you even bother with a supermarket? We all know that most of the produce you find in supermarkets is from South America or California – at any time of the year. Even during the height of the local apple season, we find Washington apples on the shelves. Now, add to that that it is winter. It would appear to be a lost cause. But I found some things. You just have to look carefully. The Shaw’s I stopped at last week is a smaller one in Nashua, but fresh produce section has a good variety of items from all around the country and beyond. The first thing that greets you upon entering is the fruit section. In the winter, we have a lot of oranges and grapes and there are always apples, but nothing local. Not even the apples. I will never understand why local supermarkets don’t take advantage of the miles of surrounding apple farms here. Once in a while, I’ll see local apples in the supermarket during the very height of apple season, but there’s no reason to not sell them through winter. You can go to any one of these apple farms in the winter and find excellent apples. Moving on, we hit the salad greens, tomatoes, and other cold-eating vegetables. No local greens – another surprise, considering that they are often grown year-round indoors – but they did have something I never expected: tomatoes. Big, beautiful Ugli Ripe heirloom tomatoes from Maine’s Backyard Farms sat on the shelf next to basic varieties shipped from as far away as Mexico. Turn the corner and I also found 10oz boxes of Cocktail Tomatoes on the vine from Backyard Farms. These tomatoes are grown year-round indoors and distributed only as far as day’s drive. Next to the tomatoes, I found packages of Broccoli and Mung Bean sprouts and Pea shoots from Jonathan’s Organic Sprouts in Rochester, MA. There were no local selections among the cooking greens and herbs, but there were a few choices within the root vegetable section. 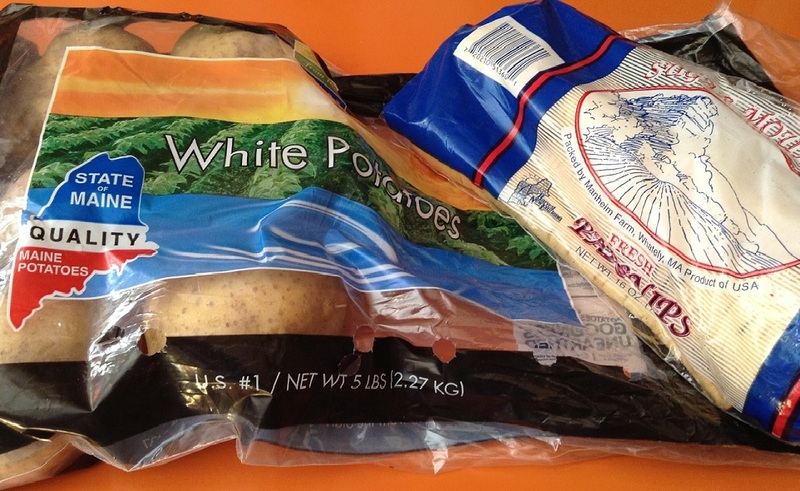 Maine potatoes are an easy find in any supermarket and Shaw’s has some bagged from Fresh From the Start – a New York state distributor. There is no indication where in Maine the potatoes come from and since they might travel from Maine to Long Island and back, one might question how local that ends up being. I set my boundaries to the ends of New England, but since New York State is just beyond that, I guess I’ll take it. They also had bagged Sugar Mountain Parsnips from Manheim Farm in Whatley, MA. Manheim is a larger farm along the Connecticut River that sells their produce wholesale only. Bags of Maine Potatoes and Sugar Mountain Parsnips from Mass. The last item I found was a bag of Morning Kiss Organic Onions in the organic section. These onions are distributed by Gold Bell of Arrow Farms in Chelsea, MA. Keep in in mind, however, that it is a distribution center. Arrow Farms makes no claims on its website that its produce is sourced locally, so the onions could have actually been grown anywhere. All-in-all, this was not a bad excursion. 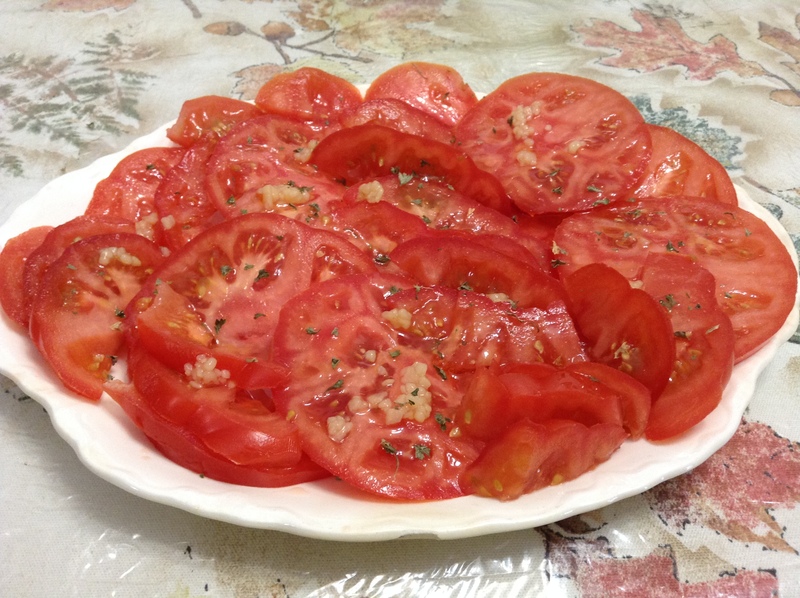 I enjoyed a nice plate of sliced tomatoes and some roasted potatoes and parsnips with dinner. I didn’t expect an abundance of local produce, but I found enough to get by and that’s what counts. You can find local food in the off-season. You just need to read labels and stickers and be persistent. Great information Patti, I’ve never given much thought to where my produce comes from and you’ve made it clear that local is always fresh. That tomato that you found will be in my next shopping cart by the way! Thanks, Judy! Word to the wise about the tomato, though, don’t bother getting it if it feels as hard as any other store-bought winter tomato. One of the ones I picked up was and it was just as bad. I used to get Ugli Ripes at Lull Farm years ago in the winter. They were shipped up from Florida and displayed in individual foam webbing to protect them. They were amazing — summer all over again.